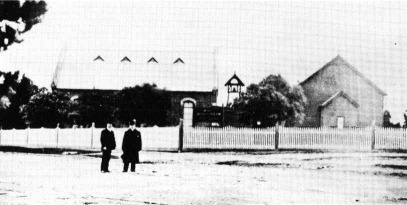 The first service was held in North Essendon on Advent Sunday, 1st December, 1889 in a rented cottage in King Street, North Essendon. The service was officiated by the Rev. G Gladstone, a total of 6 people attending. A Sunday School was also commenced. Shortly after the congregation moved to a temporary building in Mt Alexander Road opposite the Methodist Church, very soon a wall had to be removed because of the growth in numbers. A meeting of those interested in making an effort to raise a permanent building was held in April 1890. During the same month Rev. John Good was appointed as Curate in charge, under the auspices of the Vicar of St Thomas’, Moonee Ponds. 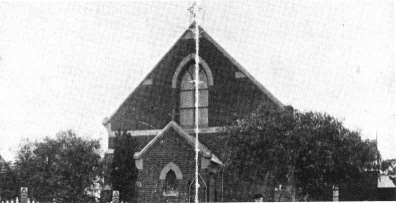 On 17 June 1890 the decision was made to name this new Christian worship gathering Christ Church, North Essendon. An organ was purchased for 20 pounds in August and the committee enthusiastically started planning a ceremony to lay the foundation stone. Mrs Puckle, wife of the first incumbent of Essendon, was bestowed with the honour but unfortunately, became ill and was unable to attend the ceremony. The stone was therefore laid by her daughter Miss Mary Puckle on Saturday, August 23rd, 1890. The grand opening was celebrated on Advent Sunday, 30th November 1890, with the Ven. Archdeacon Stretch M.A. preaching at the 11am service, a total of 90 people attending. Rev D.M. Berry M.A. preached at the 7pm service, 160 people attending. A fence was erected in June 1891 to keep the beasts of the surrounding fields from grazing too closely. Unfortunately this did not counter the noise of the lowing of cattle and the incessant chatter of sheep being driven by stockmen down Mt Alexander Road. Christ Church was officially appointed a separate Parish on the 2nd August, 1895 and Rev. John Good was appointed to the incumbency. The rapid continued growth in the number of Sunday School scholars led to the decision to erect a new building. The hall was opened in January 1898. In 1902 the Church carried out work among the Chinese, at that time nearly all of Glass Street was made up of Chinese Market Gardens. There were classes for them 3 nights a week. The Chinese were regular in their attendance at the evening service. By this time Christ Church had grown to be a well established parish of Christian worship. Amongst the organisations and sub-committees were the Decorators Guild, Association of Young Men, the Works Committee, Cricket Club, Sunday School, Sewers Band, Mothers Union and Choir. With the appointment of Rev M Whitton in 1902, so too came controversy. Mervyn Whitton was a man who believed in the ritualistic practices of the church service. The changes brought about by this belief attracted a great deal of publicity through local and church media. As a result of the dispute the Administrator of the Melbourne Diocese, Dean Vance, gave his decision on the complaints of “ritualistic practices”. The Dean ruled that the use of coloured stoles and the adoption of an eastward position at the consecration of the elements are not ecclesiastically illegal acts and the singing of the Nunc Dimittis at Holy Communion to be a harmless act, but inadmissible. A further complaint that the Incumbent had “elevated” the elements at Holy Communion was denied. At a special meeting of the congregation, Mervyn Whitton was show overwhelming support, 180 members of the congregation having confidence in what he was doing. The congregation had outgrown the small Church by October 1916, therefore the wooden Parish Hall, which was fortunately the same width, was moved. This was carried out between two Sundays so as not to interfere with the services. The brick wall at the east end of the Church was demolished to enable this to happen. This gave approximately double the accommodation in seating. After a short time the congregation outgrew the double building and it became necessary to face the prospect of a new and larger Church. The war delayed construction of the new church, the plans of which were approved in August 1917. In 1920 H.R.H. the Prince of Wales granted permission to call the proposed tower The Prince’s Tower as a memorial of his visit to Melbourne. The foundation stone was set on the 8th May 1921 by Brig. General H.E. Elliott, who at the ceremony said that “the square mile in this portion of North Essendon had given a greater number of men, who paid the supreme sacrifice, than any other square mile in the British Dominions”. The Great War of 1914-1918 saw 120 Parishioners service in the forces, of which 42 were killed in action. Permission was granted by the Diocese of Melbourne for the new church to be a war memorial church. St Martin’s Chapel in the octagonal turret, has a tablet that bears the names of those from our Parish who served in the Great War. 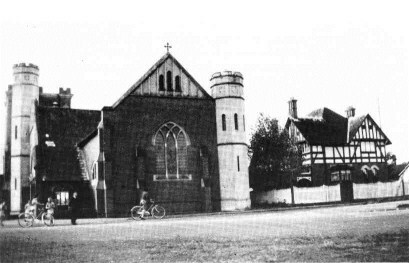 The new church was dedicated on the 15th October 1921. Four stained glass windows were dedicated and unveiled in December 1921. A number of wounded soldiers who had settled in the district were not adequately supplied with needful comforts, so the Vicar organised a concert in the Moonee Ponds Town Hall, to which he brought Dame Nellie Melba as a special guest. Apart from the wonderful financial result due to the crowded hall, Dame Nellie during the interval sold a box of sweets for upward of 100 pounds. In 1927 the decision was taken to extend the Prince’s Tower a further 20 feet to provide a fitting chamber in which to place the new organ. The organ was installed and dedicated in 1929. A passion play, the first for Christ Church and thought to be the first for Melbourne, was staged by eight of Christ Church’s young folk during April 1934 there being 4 scenes with incidents pertaining to Palm Sunday, Good Friday, the Jewish Sabbath and Easter Day. A Memorial Altar for a Lady Chapel was presented in 1938. As from May 1943, the Lady Chapel was also known as “The Chapel of Honour” to remember those serving in the armed forces and those who had died whilst on active service. In March 1946, the Vestry of Christ Church decided to launch an appeal for funds to build a daughter church necessary in the rapidly growing Strathmore area of the Parish. The intention was for the Strathmore Church to be a memorial from Christ Church for all who have served in the war and as thanksgiving for the blessings of victory and peace. 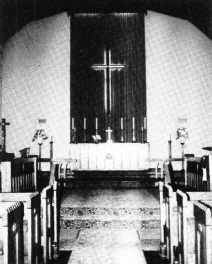 The first service at St Aidan’s Church, Strathmore, was held on 26th October, 1947. In 1947 the Salmon Memorial Window which had been above the Altar was placed in the North Transept. Not all parishioners were in favour of this modification. The change came about due to the excessive sunlight that beamed through the window, particularly in the summer, making the Sanctuary very hot. The window was replaced by a curtain and canopy. In March 1962, the Vicarage foundations were underpinned in four places on the east side. At a special meeting of the Vestry in 1965 it was decided that a new Vicarage should be built, it was completed in June 1967. A long standing dream of some of the ladies of Christ Church became a reality with the opening of the Christ Church Opportunity Shop, in Hoyt’s Buildings, Leake Street, on August 19th, 1965. In February 1966 the Shop moved to 6 Leake Street and in 1974 moved again. Over the years of the parish there have been many Joys and Tears. The record of vocations to the priesthood and the religious life from members of the congregation are eloquent testimony to the spiritual health of Christ Church over the years. This history has been extracted from the booklet “Christ Church North Essendon 1890-1990; the joys and tears of 100 years” by Judy Ellison, 1990.